Computer Science and Engineering is a discipline that integrates several fields of electrical engineering and computer science required to develop computer hardware and software. The fields include software engineering and design, artificial intelligence theory, programming languages, information systems and information technology. Computer engineers typically design not only the hardware, but also much of the software in computer-based systems. This is the age of Computer Science and Technology. So the demand for efficient computer engineers is very high. As a result, today’s students are highly interested in CSE. 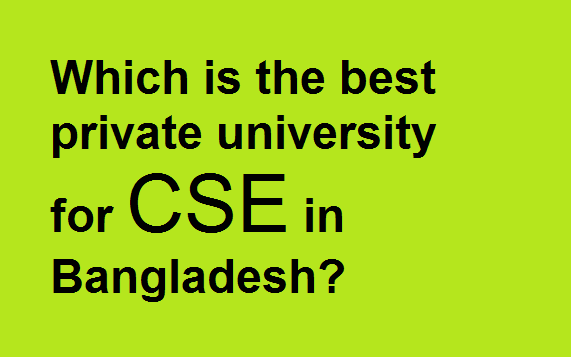 Many Government and Non-Government Universities of Bangladesh offer CSE. Today we will provide you with best universities which provide CSE here in Bangladesh. These are comparatively the best universities among all the universities that offer CSE. The reason theses universities could make their places in our list are that they have better education facilities, faculties and their reputation in recent years. Thanks to our research team for bringing out the best result for you. Hopefully it will help you to choose your institution wisely. N.B: There is no government or any official ranking or list . This list is based on students’ choice and university’s facilities(Lab, Faculty, Class, Extra Curriculum) for students. So, anyone can have different ideas about it and disagree with it. Campus.com.bd will not be responsible for any issues caused by this list.